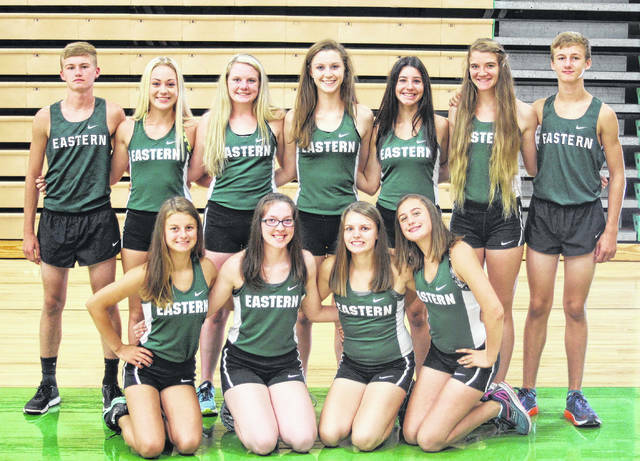 Pictured above are members of the 2017 Eastern cross country team. Kneeling in the front row, from left, are Haylie Blankenship, Alysa Howard, Ally Durst and Lexa Hayes. Standing in the back row are Owen Arix, Hannah Hill, Whitney Durst, Kaitlyn Hawk, Rhiannon Morris, Jessica Cook and Colton Reynolds. WELLSTON — Simply put, the Lady Eagles were more than just good on Saturday at the annual Tri-Valley Conference cross country meet. That’s because Eastern amassed a perfect team score of 15 in the girls Hocking Division race, as it captured its seventh consecutive TVC Hocking title — as this year’s competition took place at Wellston High School. Eastern, in fact, had the first six scores belonging to one of only two TVC Hocking girls squads to post a team score — with Federal Hocking (48) having the minimum five runners as the other. The Lady Eagles fielded seven runners of the 23-girl TVC Hocking field, as all placed within the top 14 and six within the top nine. All of Eastern’s individuals whose scores counted towards the team total earned All-TVC Hocking Division honors, as the top seven runners in each race in each division made All-TVC. Leading the Eagles, and all TVC Hocking girls runners, was junior Ally Dust — who completed the 5K course in exactly one second under an even 21 minutes. Durst was fourth in last season’s race. Right behind her, by a single second in exactly 21 minutes, was senior Jessica Cook — who completes her high school career having placed in the top two in the TVC Hocking race in each of her four years. She was the back-to-back TVC Hocking girls race champion, as she also finished as the race runner-up as a freshman. In addition to Durst and Cook, junior Rhiannon Morris (4th in 22:23), senior Kaitlyn Hawk (5th in 22:48) and freshman Whitney Durst (7th in 23:11) also made all-league. The Lady Eagles’ other two runners were sophomore Lexa Hayes (9th in 23:27) and freshman Alysa Howard (14th in 26:38). Southern sophomore Sydney Roush finished third in the race, crossing the line in 21 minutes and 56 seconds — and landing all-league between the top four Lady Eagles. The other three Lady Tornado runners were junior Mallory Johnson (11th in 24:58), junior Madison Lisle (17th in 27:26) and sophomore Addie Matson (22nd in 31:55). South Gallia’s lone female representative was sophomore Alex Lu, who placed 16th in 27:03. The only other All-TVC honoree was Trimble junior Haily McKee, who was sixth in 22:54. On the boys side, Eastern’s only competitors — sophomore Colton Reynolds in fourth in 17:41 and senior Owen Arix in fifth in 17:51 — both secured all-conference spots. So too did Southern senior Larry Dunn, who was sixth in one second under an even 18 minutes. Dunn took fifth in the same event last season, and thus repeats as an all-league runner. The other two Tornado runners – senior Dakota Kowell (25th in 21:04) and freshman Jared Koening (26th in 21:17) crossed the finish line back-to-back. The two South Gallia individuals were freshmen Garrett Frazee (11th in 18:28) and Griffin Davis (31st in 24:21). There were 33 runners in the boys high school race, which was won by Belpre freshman Eli Fullerton in a fast 16 minutes and 58 seconds. The other remaining all-league runners were Trimble’s trio of junior Eric Everett (2nd in 17:30), senior Tyler Hudson (3rd in 17:30) and sophomore Braydon Weber (7th in 18:09). Trimble — with a score of 20 — took home the TVC Hocking team title, as only Belpre (35) and Federal Hocking (83) had teams as well.